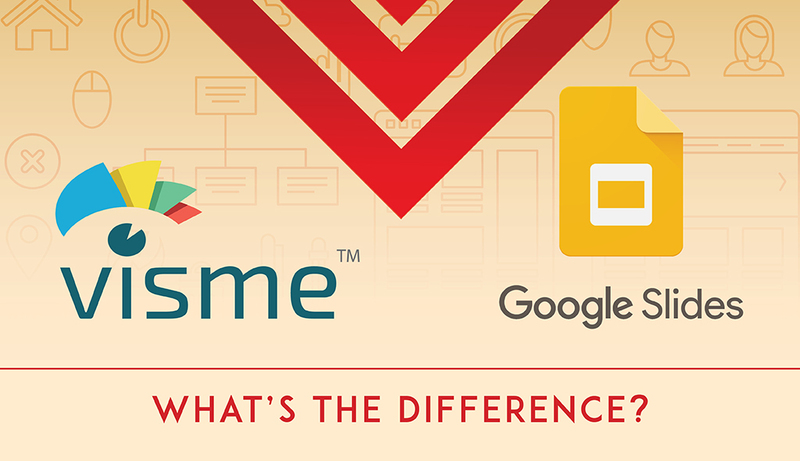 Visme vs. Google Slides: What’s the Difference? In the last few years, browser-based presentation tools like Google Slides and Visme have been slowly, but surely, winning over users who once thought PowerPoint was the best software for creating beautiful slide decks. Lightweight, simple and intuitive, these free online presentation tools offer more of what users really need when it comes to creating a presentation: collaboration tools, the ability to access slide decks from anywhere and easily publish presentations on the Web and share them. Although Visme and Google Slides belong to the new generation of cloud-based apps that allow users to easily share ideas and work on projects together, there are key differences. 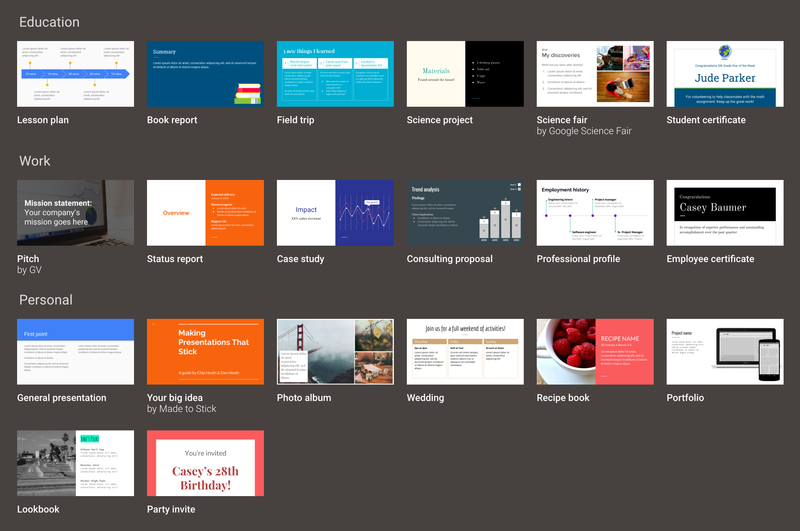 For example, Visme goes beyond Google Slides in that it offers a wide variety of built-in graphic assets anyone can use to create professional-looking slides. One of the key similarities between the two is the ability to easily publish and share files with others. In Google Slides, all you have to do is choose the option “Publish to the Web” from the File menu and click on Publish to generate a link anyone can use to view your project online. You can also allow other users to edit and comment on your presentation. To do the same in Visme, you simply click on the Publish button at the top of the screen and you’ll see a link automatically generated under the Share tab. With this link, anyone can view your project from anywhere (unless you decide to password protect it. See item number 5 under differences). 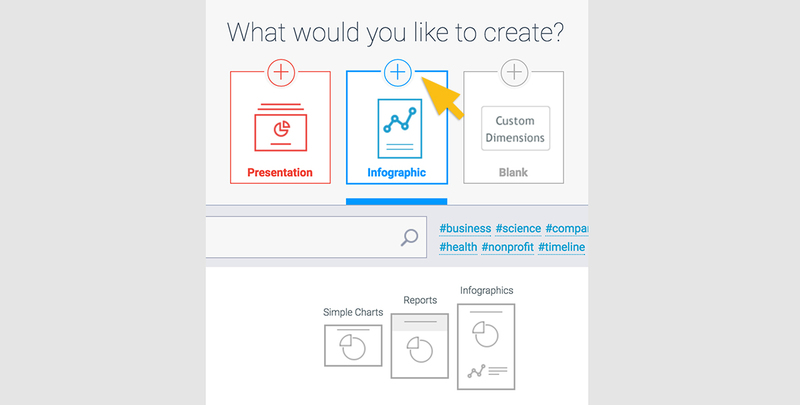 With Visme for Teams, you can also share your projects with colleagues and allow them to edit it. Both Visme and Google Slides offer hundreds of free fonts, which can be applied according to the visual theme of your presentation. In Google Slides, these can be found at the top of the screen, after clicking on a specific textbox. Similarly, in Visme, a drop-down menu with different typefaces appears after clicking on a textbox. Google Slides also allows you to edit the appearance of text by adjusting the space between lines, resizing text boxes, applying a fill color and choosing the type of alignment. Visme allows you to do the same with its revamped text editor, which now allows you to apply a specific font or size to individual text elements within a text box. One of the main differences, however, between Visme’s text editor and Google’s is that the former provides users with pre-designed stylized text boxes and animated text options (see video above). 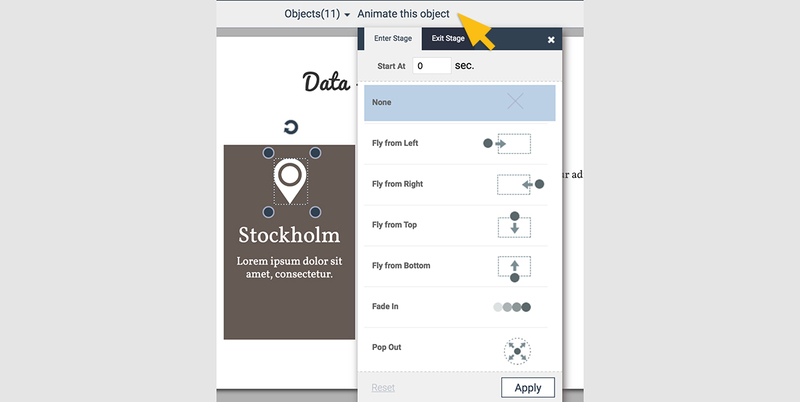 Google Slides offers users a handful of animation effects which can be applied to any object. You simply go to the Insert Menu and choose the Animation option. While both Google Slides and Visme allows users to animate any object using a handful of different effects, Visme allows users to set and edit all their animation effects off of a single animation timeline. This makes it easier to control the appearance of each object on a specific slide. Also, both Visme and Google Slides allow users to add hyperlinks to any object and link between slides to create interactive presentations. Another similarity is that users can embed their final slide deck into any website or blog using an embed code. In Google Slides, you simply choose the “Publish to web” option from the File menu and choose the Embed tab from the pop-up. In Visme, you simply press Publish at the top of the screen. And then copy the embed code that appears under the Embed tab. Now to the main differences between the two. 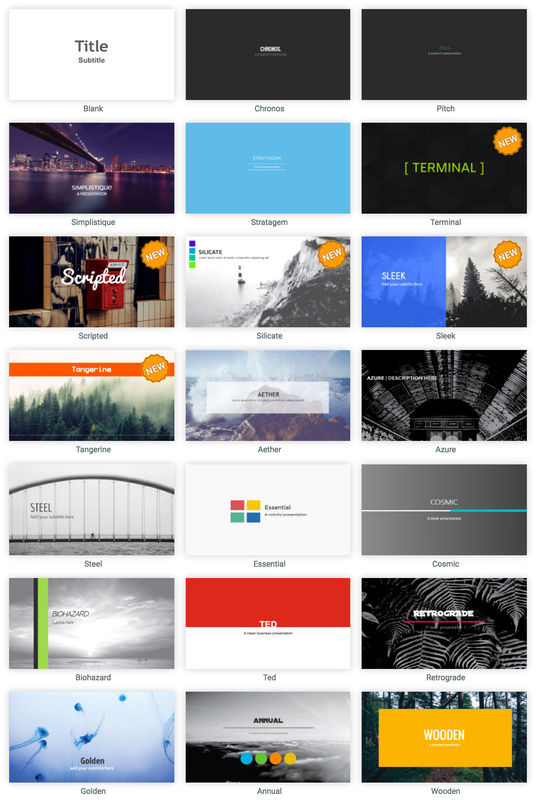 For starters, Visme offers a greater number of presentation templates to choose from (39, while Google Slides offers 26). In Google Slides, these are organized according to the type of presentation you want to create: a pitch, lesson plan, book report, etc. Meanwhile, in Visme, themes are organized according to visual styles, which can be browsed through by simply clicking on the bottom right corner of the template. As seen in the video above, Visme seems to offer a bit more variety in terms of pre-designed slides with examples of diagrams, process charts and graphs. Another main difference is that Visme offers users not only the ability to create presentations, but also infographics, reports, resumes and banners, among other types of visual content. While Google Slides is part of Google Drive, which also offers Google Sheets and Google Docs, it does not allow users to create visually appealing content in the form of infographics. Visme, on the other hand, offer users hundreds of infographic templates, as well as tons of graphic assets that can be dragged and dropped onto the canvas area to create virtually any type of visual content, which is especially for social media and marketing campaigns. Another key difference is Visme’s extensive and searchable icon library, which provides users with more than 6,000 high-quality vector icons in different styles. Meanwhile, Google Slides offers only outlines of basic geometric shapes and arrows. To access Visme's vector icons, simply click on the Icon tool on the left toolbar. These can be used to quickly communicate key concepts in your presentations and infographics, as well as easily customized to fit the visual style of your presentation or infographic, as seen in the video above. Visme offers users a searchable image library with millions of photos that can be inserted into your presentation without having to leave the interface and open a new tab. 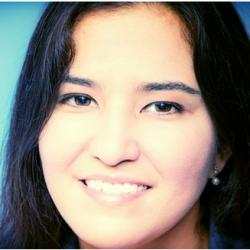 Privacy and security are huge concerns for content creators everywhere. This is why Visme also provides users with the ability to make their projects private or password protect them so that they are only accessible to those you have entrusted with the password. To do this in Visme, simply click on the Publish button and choose the Password Protection option under the Share tab. Meanwhile, Google Slides allows users to turn link sharing off and allow only specific people to access your file, which is not the same as password protecting a file, but, in effect, has the same objective of allowing you to control who can see your project. One of the most important differences between Visme and Google Slides is the ability to insert third-party content. Visme offers users an iFrame tool that can be used to insert interactive content such as surveys, polls, quizzes, maps, live feeds, web pages and virtually any third-party content with an embed code. 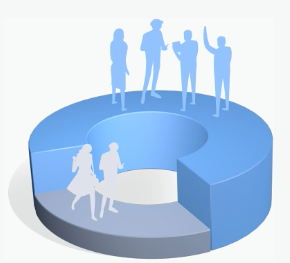 Another useful feature offered only by Visme is the ability to generate leads with your presentations and slide decks. By simply clicking on the Publish button and activating the Requires Registration feature found under the Settings tab, all visitors to your project will be asked to fill out a short form to view the presentation. In the end, you'll have a list of dates, names, companies, emails and locations you can import to your favorite CRM or newsletter system, such as MailChimp, Constant Contact or Salesforce. Interested in seeing who’s viewed your project, for how long and from where? Visme also differentiates itself from Google Slides by providing a powerful analytics feature that allows you to see how well your slide deck is engaging your target audience. Simply click on the hamburger menu to the bottom left of your project's thumbnail and choose the Analytics option. You can then view the total number of visits to your project, the duration of each and from where it was accessed. While Google Slides allows you to insert charts and graphs using data from Google Sheets, it does not give you the ability to create animated and interactive charts and graphs. 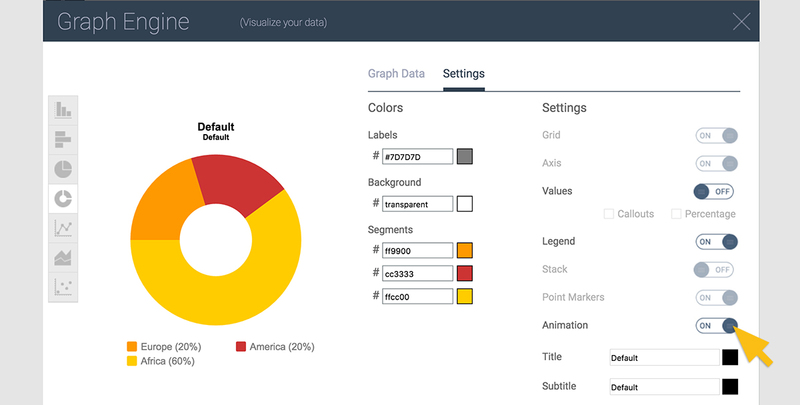 This can easily be done in Visme by selecting the Charts and Graphs tool and inserting your data directly into the pop-up that appears on your screen. The resulting chart will then be animated by default (although you can deactivate this feature) and display values when you hover the cursor over each bar or segment. Additionally, Visme allows you to keep track of and reuse all your past media assets through its new media manager. This allows you to reuse images, icons and GIF files from previous projects. Simply click on the Image tool and then choose the My Library option at the top of the docked panel. From the pop-up that appears, you can manage all your previously used media assets, including images, icons and GIF files. Finally, Visme also makes it easier to create great-looking content in less time by providing users with 50 color combination presets that can be applied to any project, depending on the visual style you have in mind. From elegant themes to more lively and vibrant palettes, Visme offers beautiful color presets for a variety of preferences and project types. In sum, both Visme and Google Slides are great tools for collaborating with team members and increasing productivity by eliminating some of the clunkiness characteristic of legacy software such as PowerPoint. On the other hand, Visme goes a step beyond Google Slides by also offering a simple drag-and-drop visual content creation tool that can be used to create great-looking content every time, even under time constraints. 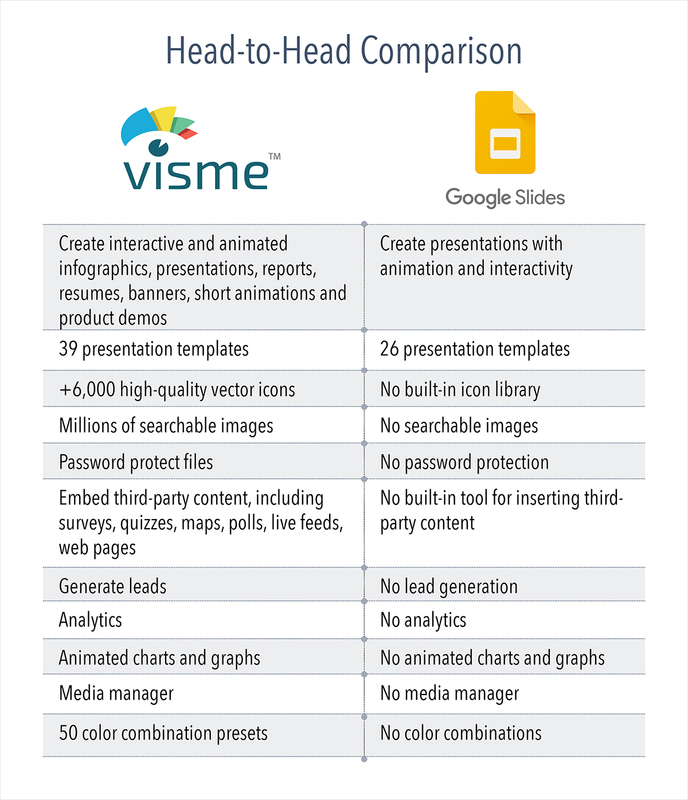 So, what’s your take on the Google Slides versus Visme comparison? Which best fits your needs at the moment? We would love to hear your comments and feedback. Just drop us a line below in the comments section, and we’ll get back to you as soon as possible. How much does the programme cost? It seem a lot just like Microsoft Presentation?